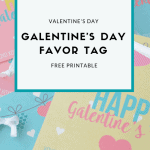 Valentine’s Day isn’t only for romance, and it certainly doesn’t have to be a Hallmark holiday (though it can certainly feel that way), but a chance to share some love with those around you, be it for your neighbor, your best gal pals, or your kids. 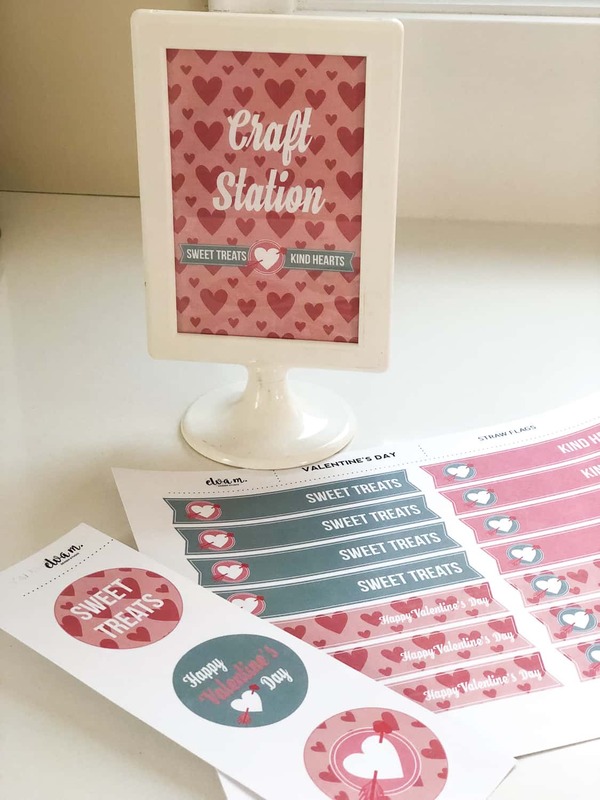 This Sweet Treats, Kind Hearts Valentine’s play date is a fun day for your kids, with a charitable craft that will bring some joy to your community. This party is actually from last year but I’m excited to share it with you and the free printables so you can throw your own play date. Read on to get all the details about this collaboration with Legally Crafty and Sprinkles and Confetti. My friend, Holly, over at Legally Crafty is a DIY guru and she’s always creating fun and easy ideas to celebrate the season. 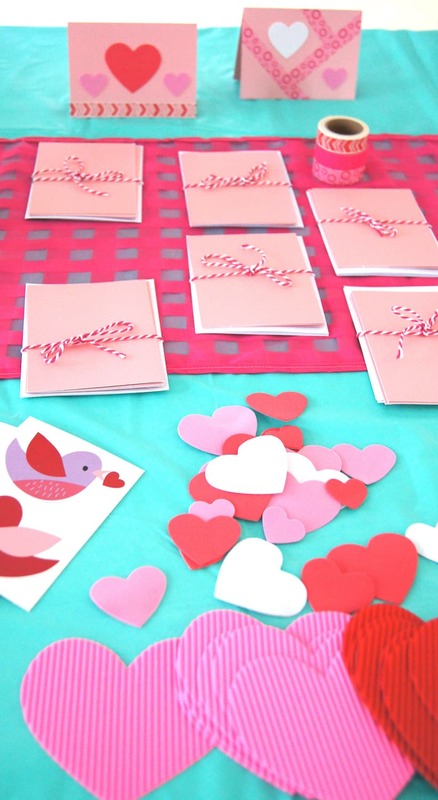 She came up with these Valentine’s Day crafts that are perfect for little hands to create. You can get all the details on her blog to set up your own craft station. The first project are DIY Valentine’s Day cards to share with children’s hospitals and nursing homes. All you need are some blank cards, stickers, washi tape and markers. Next up is a DIY wood clipboard photo frame, perfect for displaying a sweet snapshot. Holly has all the DIY supplies and steps on her site, or you can buy some pre-made clipboards to decorate. 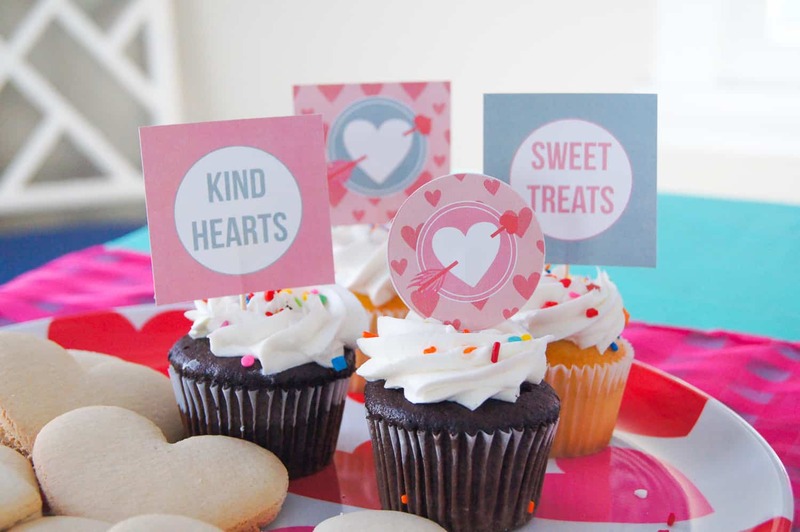 Jackie from Sprinkles and Confetti, an online party supply shop, curated the cutest party supples for this Sweet Treats, Kind Hearts play date. Keep things simple with a disposable teal table cloth. Use heart paper plates and napkins to keep clean up a breeze. These “sweet” napkins perfectly match the printables— in fact, I used them as inspiration! Jackie has a great selection of balloons, including these mylar heart balloons in pink and silver. Jackie is a go-to source for party balloons; check out my puppy party balloon garland. I love this DIY card garland, another fun DIY from Legally Crafty. Keep it simple with some popcorn, cupcakes, and sugar cookies that the kids can decorate. Serve water and lemonade to wash everything down. 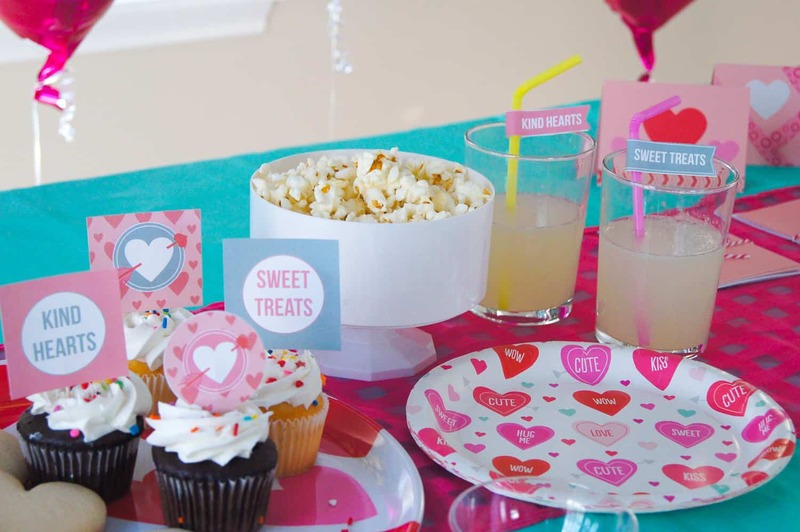 I love using party printables as an easy and cost-effective way to decorate a party. I’m sharing this set with you to create your own play date, and it even comes complete with an invite! To download your files, simply fill out the form below with your email address to sign up for my newsletter. You will also receive access all of my free printables. I would love to see how you style these. Tag me on Instagram @elvamdesign and hashtag #elvamdesignstudio. Don’t forget to come back and check out other seasonal play dates, like this one for Halloween. 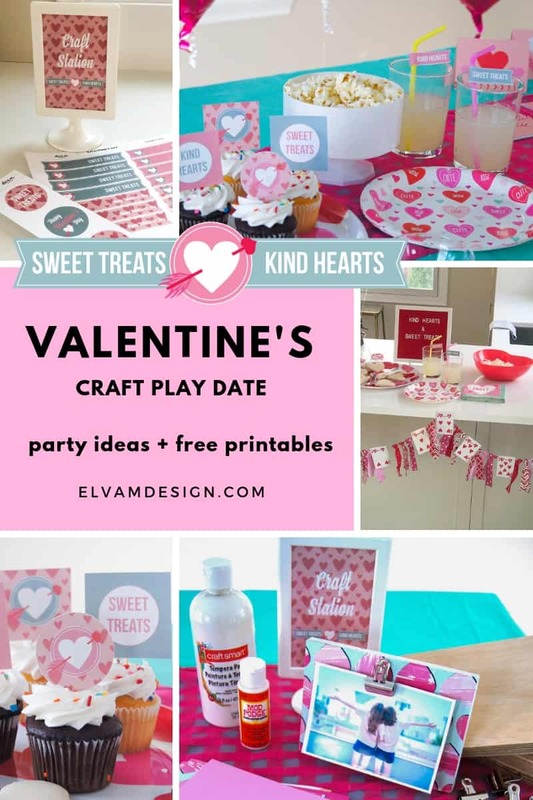 Or you might enjoy some other Valentine’s Day ideas like this “Love” Valentine’s Day Party, which also includes a free printable!